L&E Fabrication was opened in 2003. The father and son team of Larry and Erik Schmidt founded the company. They realized a need to supply specially modified faster ratio steering columns. They also saw a need for improving the handling of Subaru's, so they began selling Super Poly Pro bushings and stocking all Subaru bushings. Larry and Erik together bring over 40 years of Rally car preparation experience. 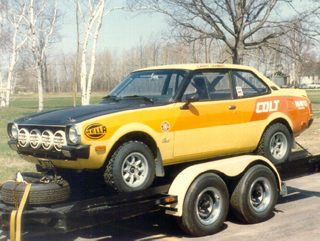 Larry began his rally career as a driver in 1978 when he started campaigning a brand new Dodge Colt (Mitsubishi Lancer). He fully prepared this car from the ground up to a very reliable and competitive rally car, and was rewarded with the 1978 SCCA Pro Rally "Rookie of the Year" for the Eastern USA. Together, Larry and the Colt competed in over 42 rallies over the next 6 years. During this time, the car's dependability and Larry's driving ability were demonstrated by many top five overall finishes. The Colt was replaced with a front wheel drive Dodge Shelby, which did not suit to Larry's driving style. The next vehicle was a Mazda 323 GTX. 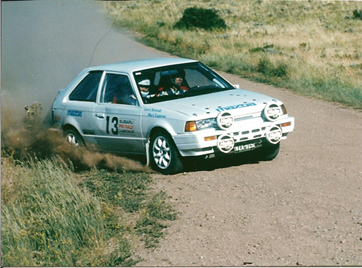 This was Turbo 4-wheel drive that Larry drove in competition at divisional Colorado rallies from 1991 to 1993. During this time he won the divisional title each year and finished as high as third over all in the 1992 Gold Rush national event. In 2004 (when Erik was finally old enough to compete) the L&E Subaru rally car's life begins. The agreement between Erik and Larry was that Larry would drive the first year in competition and Erik would learn from his dad's expertise from the co-driver's seat. These rolls would soon switch. Erik learned quickly and began to show that he was able to be as competitive as a driver as Larry had been. Erik and Larry competed mainly in rallies and hill climbs. When Erik teamed up with Mike Rose in 2006 they competed in the divisional rallies in Missouri and Colorado hill climbs. From there Erik showed more competitiveness at the Oregon Trail Pro Rally, but his success ended on the last stage of the 2nd day with an encounter with a tree stump. In 2006 Erik 3rd place overall in the Rally America Western States Championship. For 2007 Erik teamed up with a new co-driver, Randy Morris, and focused on the Colorado Hill Climb series, which consists of 5 hill climbs. Erik's efforts rewarded him with a 2nd overall in the 4-wheel drive class. In the January 2008 issue of Sports Compact Car they featured the L&E Subaru with an article called "Real Deal". The article highlighted the components of the car including the L&E steering quickner and Super PolyPro bushings. With our years of experience let us help to properly equip your car.